Rebel Legion :: View topic - Submitted my first costume... what's next? Submitted my first costume... what's next? Posted: Tue Jun 12, 2018 8:20 pm Post subject: Submitted my first costume... what's next? 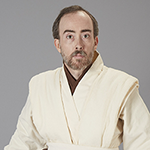 I just submitted my first costume, a generic Jedi, courtesy of the great work from Jen Eyre! Now I want to ask the lot of you want costume you suggest I work on next. What is Alderaan Base missing? Here is some pertinent info to help with suggestions. I am 6'2", 230 lbs, built like a linebacker. I am a general contractor, and have been cosplaying for about a decade, so I have a bit of experience in construction, making props and costumes. What do you think? What's next? I would start by heading over to the New England Garrisons website 501neg.com and signing up there. AB doesn't really use the main RL forums for communication, we pretty much share the NEGs forum.